The Municipal House, a national cultural landmark, is among the most significant Art Nouveau buildings in Prague. It is located in the very centre of Prague, directly neighbouring the Powder Gate. 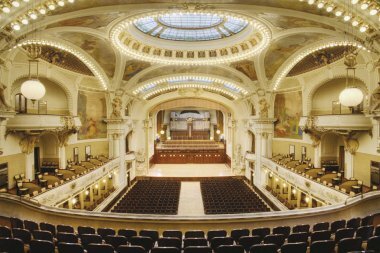 The most significant Czech painters and sculptors of the time participated in the decoration of the Municipal House. That list included: Jan Preisler, Mikoláš Aleš, Max Švabinský, František Ženíšek, Ladislav Šaloun, Josef Mařatka, Josef Václav Myslbek, Alfons Mucha. Since the very beginning, the Municipal House has been a multifunctional building. The halls and lounges are used to arrange conventions, conferences, concerts, balls and fashion shows. They are accessible to the general public only in the form of commented tours. In the years 1994 - 1997 the Municipal House underwent a technically and financially demanding restoration. When it was re-opened, it once-again became a significant social and cultural centre. © 2019 Nové umění s.r.o.